Fresh on the heels from speaking at Google Developer Day in Beijing and Tokyo, Chris DiBona will be heading to the SouthEast LinuxFest. This new conference promises to provide a welcoming environment for novice users of Open Source software, with a little something for everyone with talks on data warehousing, education and philanthropy. 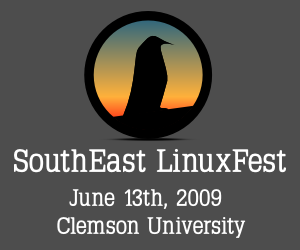 Should you find yourself in or around Clemson, South Carolina this Saturday, June 13th, please stop by to hear Chris discuss "Open Source: Then, Now and Tomorrow." As much as the Open Source Team enjoys connecting with Open Source developers and users worldwide, Chris is particularly looking forward attending this grassroots, community driven event and sharing his thoughts in this intimate setting. We hope to see you there and, if you're attending, please do come by to say hello!